Europe, Africa, India and China… The whole world in one island! It is often referred to as the ‘Continent-Island’ due to its diverse cultures and ethnicities, and Mauritians pride themselves on being able to live in harmony and respect the different religions and ethnic groups represented here. The striking natural beauty and diversity of Mauritius are reflected in the warmth of its people. The richness of their culture and heritage binds them together. The Mauritian smile is genuine and the people are well known for their hospitality and warmth. You will always feel welcome in this friendly country. The best way to meet the locals is on the public beaches, or in the shops and market places on weekends and public holidays. Going on guided tours with locals or adventure companies are great ways to discover Mauritius and the history and culture of its people. Discover their fun side by partying the night away at one of the many nightclubs or parties on the beach! In 1735 the French governor Mahé de La Bourdonnais made Port Louis a key harbor in this part of the ocean. Today, it is the island’s capital city and is worth a visit to see why Mauritius is hailed for its economic achievement. The best place to park is in the Caudan Waterfront, from where you can easily walk around the city, by far the busiest place in Mauritius during the day. Feast your eyes on the colourful fruit and vegetable market, and let your senses be awakened by the scent of oriental spices in China Town with its restaurants serving delicious dishes. Enjoy walking along the old cobbled streets and seeing the original colonial houses and buildings that make this city so unique and interesting. Discover the museums and monuments, and do some shopping in the hundreds of shops selling everything from fabrics, to jewellery, to world famous clothing brands, there really is something for everyone! To top off your day, take a drive to the Champ de Mars, the oldest horse-racing course in the southern hemisphere. Or if you want a beautiful view of the whole of Port Louis, visit the Citadelle, an old fort that once guarded the harbour against enemy attack and from local rebellion. For another stunning view, take a walk up the steps of the church of Marie Reine de la Paix, on the side of Signal Mountain. Mauritius has the most amazing white coral sand beaches and crystal clear lagoons, which contrast vividly with the backdrop of black volcanic mountains. It seems that Mother Nature has chosen our beaches to try out a palette of blue, white and sparkle! The best beaches definitely worth a visit are Pereybere, Flic en Flac, Le Morne, Belle Mare, Blue Bay and Ile aux Cerfs. A day at the beach is also a great opportunity to mingle with Mauritian families who enjoy picnicking on the beach on sunny days. A good way to discover the differences between the North, East, South and West, is to drive around the coast visiting the different beaches. Each region is unique and has so many treasures waiting to be discovered. The North, with its flat, sandy beaches and stunning weather, is action packed and has plenty of activities on offer. The East boasts large turquoise lagoons and is windier, especially in winter. The South with its wild, steep cliffs is a stunning part of the island that is a must-see. The West and South-West are hot and dry, perfect for surfing and kitesurfing, among other activities. Life in Mauritius spins around the inviting warm waters of the Indian Ocean. Visitors can take advantage of this water paradise by trying out a variety of water sports and activities around the island. There are water sports galore to choose from: pedaloes, kayaks, water skis, sea karting, surfing, windsurfing, stand up paddleboarding, glass bottom boats, catamaran cruises, dolphin watching and big game-fishing… For the more adventurous among you, there are an underwater walk, submarine trips and parasailing. Mauritius is a well-known diving destination, and snorkelling can be done in most lagoons, where you’ll be amazed at the sea life you can see not far from the shore. In Blue Bay, a nature reserve, you can take a glass bottom boat into the reserve and then snorkel in the lagoon – an experience that you will remember forever! If kitesurfing is more your game, head for the windiest spots in the South and East all year round, and in the North at some periods of the year. Hang onto your hat! You cannot possibly leave Mauritius without learning to dance a few Sega steps. Whether you have twinkle toes, or two left feet, this vibrant local dance with its distinctive African rhythm will have your hips undulating to the beat! Each resort has its own Sega show, which is a perfect way to end an evening. The spirit of Africa resonates through the musical instruments – usually ravanne, maravanne or triangle are played, while the songs, sung in Creole, depict the Mauritian way of life. The Sega folkloric dance has been registered by UNESCO on its Intangible Cultural Heritage list. This is undoubtedly one of the most visited attractions in Mauritius. Created over 300 years ago by the famous French botanist Pierre Poivre, the garden is the oldest in the Southern Hemisphere and boasts a plethora of indigenous plants. See if you can spot Pierre Poivre’s statue in the gardens. Count yourself extremely fortunate if you happen to see the Talipot Palm, which blooms once every 30 to 80 years! There are also giant tortoises, Java Deer, and the spectacular water lilies. Take a break under one the many gazebos throughout the place and enjoy the tranquillity and charm of this beautiful and unique Pamplemousses botanical garden. This world famous attraction is a unique volcanic geological phenomenon resulting in seven colours of earth swirled together to create a beautiful feature. Found in the stunning region of Chamarel, this is a treasure not to be missed. Chamarel rises 283 meters above sea level and is reached by a panoramic route, which cuts through the luxurious tropical forest surrounding it. There are many places to stop to admire the exquisite view and take photos. One of these spots is an 83-metre high waterfall. 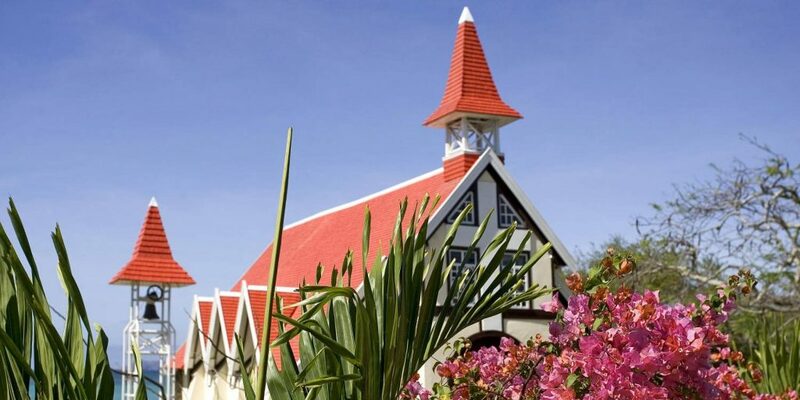 After visiting the 7-coloured earth, you can take a trip to the village to see the picturesque Church of St. Anne which was built in 1876 and is a sought after feature by visitors. This typical Mauritian village is well worth the detour for its family restaurants, and the drive back through the scenic Chamarel to Baie du Cap is magical. Mauritius’s history and prosperity are linked to the sugar cane industry. Sugar cane was introduced to Mauritius by the Dutch settlers as far back as 1639, but it was the French Governor Mahé de Labourdonnais who opened the first sugar estate in 1743. Today, sugar is no longer the backbone of the island’s economy as it has been for many years past, but its by-products, such as rum, remain extremely popular. The L’Aventure du Sucre museum in Pamplemousses will give you a fascinating look at how the countries history is intertwined with sugar. The Tea Route is also extremely popular with tourists and allows you to visit traditional tea plantations, tea factories, and museums to learn about how tea is made. Sample the delicious and unique tea blends, most notably Mauritian vanilla tea, among the world’s best! Make sure you buy some to take home. Government House, a French colonial building built in 1738, the Port Louis Theatre steeped in history, the beautiful Central Post Office and Court of Justice buildings, and the old prison adjacent to them, all deserve a visit. Two UNESCO world heritage sites – Aapravasi Ghat and Le Morne – are well worth visiting as is the Vieux Grand Port historical route which houses several historical monuments including the Dutch landing site. If you want to take home memories other than seaside ones, we recommend you swap your flip-flops for some walking shoes, step out and enjoy the rich historical heritage of Mauritius. It’s delicious, it’s Mauritius! Foodies will be in their element in a country that offers everything from Michelin-star chefs, fine dining, and enticing roadside snacks sold by street food vendors. The delicate ‘heart of palm’ salad is famous in Mauritius and something to try if your budget allows. Sample the ubiquitous street food: dholl puris, samosas, gateaux arouille and gateaux piments both on and off the streets of Mauritius, in the many small restaurants and takeaways (“snacks”). Visitors will soon learn that eating is extremely popular among the local population. Cultural festivals, such as the Chinatown Festival, are known to attract thousands of Mauritians for their food offerings.